On November 15, 2006, Aviva and AmerUs Group combined to bring their consumers even more products and services in the US. Aviva is the world’s fifth-largest insurance group and the biggest in the United Kingdom. And Bankers Life Insurance Company has become a part of Aviva. Bankers Life Insurance Company has been helping families preserve their assets and achieve their long-term financial goals for over thirty years. The company’s dedication to the changing needs of its producers and their clients continues to position Bankers Life as a leader in the domestic retirement annuity market. It offers a retirement annuity that is backed by an experienced management team, the latest technological resources, and a customer service staff of insurance specialists. With Bankers Life Insurance Company, people can count on excellence – in the quality of the products and in the personalized, efficient service. 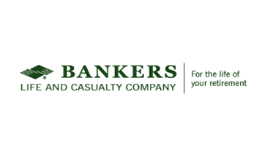 Bankers Life is a subsidiary of Bankers Insurance Group, a multi-line insurance holding company based in St. Petersburg, Florida. For over 30 years, Bankers Insurance Group has achieved impressive growth through its commitment to solid business practices, the latest technology, and unsurpassed responsiveness to customers’ needs. This dedication has built Bankers into a leading force within the insurance industry.